K P Sasikala, Kerala state president of the Hindu Aikya Vedi has, according to media reports, threatened writers who are opposed to the RSS. “Pray to stay alive,” she has advised secular Indian writers. She has suggested that they conduct a puja to avoid an untimely death like that of Gauri Lankesh. The Vedi is a platform of several groups part of, or sympathetic to, the Sangh Parivar. The Indian Cultural Forum asked writers to respond to this most recent and open threat from the rightwing. Killing writers is like trying to pluck the golden rod. Their works remain. Hasn’t the woman seen how writers, despite censorship, have spoken up for freedom? Hasn’t she seen how writers’ words illuminate our lives? 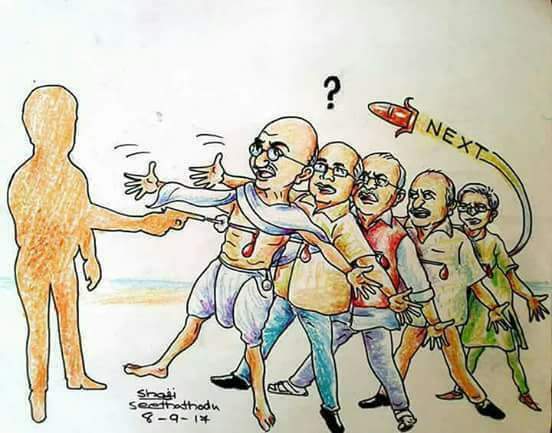 The Sangh Parivar trolled Gauri Lankesh even after her murder. The Hindu Aikya Vedi’s threat is the next logical obscenity. Threatening writers is a direct attack on democracy, freedom of speech, our culture and, indeed, everything India stands for. We will not out our pens down. Sasikala's speech, as ambiguous, inconsistent, yet calamitous as her speeches inevitably have been, is meant to work like a double entendre. On the one hand, it feebly attempts to deflect the charge that the RSS is behind Gauri Lankesh's murder, putting the onus on the Congress party and the Government of Karnataka. On the other hand, it is intended to serve as an indirect warning to all writers, including journalists, and especially the writers in Kerala who are known for their shared secular vision. They are, almost without exception, the inheritors of a tradition of communal harmony and secular culture. They have kept the communal extremists at bay in a state that has so far proved invincible for the Sangh Parivar, despite some infiltration in certain pockets. This is clearly worrying their followers, and also their leaders, who have recently given Kerala the appellation, 'killing fields’. No doubt the large community of fearless writers and independent journalists in Kerala, as well as the whole country, will treat Sasikala's words for what they have always been: venomous buffoonery. Such attacks will only strengthen our resolve to fight the communal elements who are trying to destroy the very social fabric of our diverse nation — built by the sacrifices of freedom-loving people from every community. It just gives us one more reason to resist the destruction of our culture by the divisive dispensers of hatred. This is outrageous and should be condemned by all sane citizens of India. It is a not a veiled threat to Indian writers, the majority of whom are secular, or respect all religions equally. This is an open invitation to murderers and assassins, and we demand immediate legal action against this person. The statement is an insult to Gauri Lankesh who lost her life last week. It is an insult to the community of writers. It is an insult to the values enshrined in the Constitution. It is an insult to the rich literary tradition of Kerala. It is an insult to the ancient practice of yagna. The statement is so ludicrous, it is best ignored. It deserves no serious attention. Sasikala's statement, incoherent, illogical and vicious, should be treated with contempt. Notice there isn't a word of remorse for the murder of Gauri Lankesh. It is of a piece with the vulgar and obscene trolling that some of the right wing lumpens have indulged in. But we should take notice of the threat. Writers are not going to be cowed down. If ninety percent writers are against the RSS, as she claims, the RSS should take note and introspect.